Software is like a good dish: it needs a good recipe to become tasteful. So every Software project should have a direction, a target – a philosophy. DXX-Rebirth should be one thing primarily: Descent and Descent only. Descent and Descent 2 were great games. There isn’t much space for improvements. Sure you can replace textures with high resolution versions, you can add realtime shadows, bumpmaps and so forth. But in essence Descent is Descent – and that’s my opinion. You can take the game out of 1995 but you cannot take 1995 out of the game. DXX-Rebirth is a more conservative Source Port. It’s not a clone, not a remake, not a re-creation or re-imagination – it’s Descent! As said, Descent is great as it is and when you play DXX-Rebirth you should play Descent and Descent 2. This project should keep the games alive, fix bugs, keep them on par with the current technology and give you a stable and reliable experience. When you play DXX-Rebirth you should have the same feel you had when you played the games first. This nostalgic flavour you loved so much is what we aim for. And you – the player – should feel this, too. Remember the feeling you had when you held the Descent box in your hands? The excitement you felt when the Descent 2 installation bar slowly filled your flickering monitor? Try to recall the moment when you first saw the “PREPARE FOR DESCENT” message on your screen. Think about the scary shriek when a Lifter first scratched on your Pyro’s hull. Drift back when you explored the dark caverns of Quartzon. That’s why we are here for. These were the good times – the more simple times. And that is what DXX-Rebirth should be, too. You should have fun playing. Playing the games you know and love. When working on this project, I always try to keep that in mind. Soon as I implement a new feature, I do not only think about the design of the code but also if this feature fits the atmosphere of the games. So there is a balance you gotta keep and our philosophy cannot always been interpreted as a Dogma. Texture Filtering or Transparency effects definately are graphical improvements for example. I like them but they definately are features altering the visual representation of the games. So for you they might alter the feel of the games, too. That is why they all are optional. I do not try to please everyone – it’s impossible. But I try to be diplomatic and I listen to the voice of my self from 1995, playing Descent on a 80486DX2. And we respect your opinion and your feedback as well. DXX-Rebirth is Open Source after all and Open Source also means “Community”. So always tell us what you think about our way of your favourite game. Status update: Nightly builds are here! DXX-Rebirth v0.60 BETA 1 released! DXX-Rebirth v0.60 public BETA in the making! Overload – the new 6DoF game from the creators of Descent! 35% of donations go to cancer-research. Descent is a trademark of Interplay Productions. 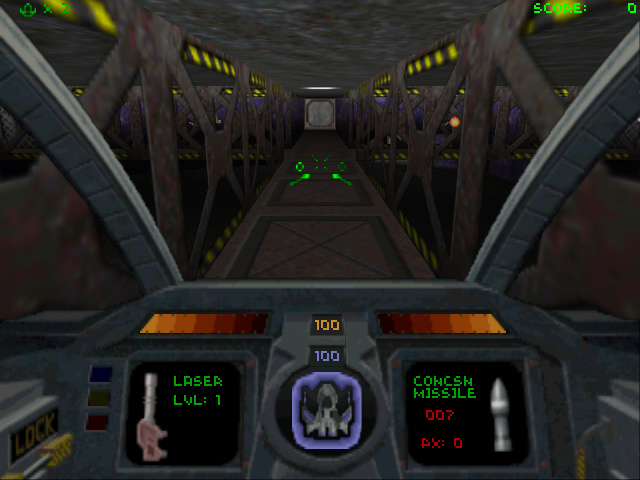 Descent, Descent II are © Parallax Software Corporation. DXX-Rebirth, D1X-Rebirth and D2X-Rebirth are © by Christian Beckhaeuser 2005 - 2015. DXX-Rebirth | Powered by Mantra & WordPress.